Preventive dental care is essential to maintaining healthy teeth and gums. We see no shortage of tooth decay in our practice; in fact, it is overwhelming at times. We feel it is necessary to see children regularly for preventive care. We also feel it is important to educate both children and their parents as to the importance of oral health care, and the sooner you start the better. At our dental hygiene appointments, it is our goal to accomplish that. 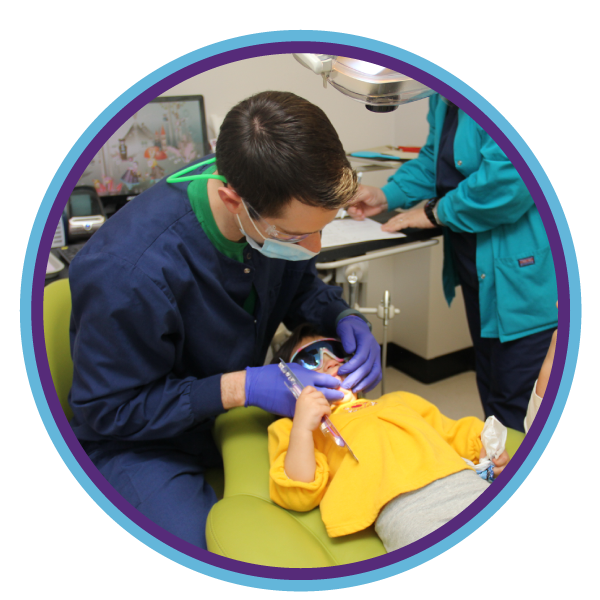 If your child is scheduled for a hygiene appointment, one of our hygienists will check for tartar and plaque; then clean and polish your child’s teeth. During this time she will also review age-appropriate brushing and flossing and answer any questions you may have about cavity prevention or dental hygiene. The hygienist may ask to take x-rays of your child’s teeth. Dr. Fishbaugh, Dr. McCrea, or Dr. Kilgore will perform a thorough exam checking for cavities, evaluating growth and development and any other concerns. Their findings and recommendations will be discussed and they will gladly answer your questions about the recommended treatment or dental health in general. Fluoride helps to strengthen teeth and prevent tooth decay. It is naturally found in water in small amounts, as well as in some foods such as meat, eggs, tea and fish. In our office, fluoride is applied after the teeth are cleaned. We typically use a gluten-free fluoride gel that is brushed on the teeth. 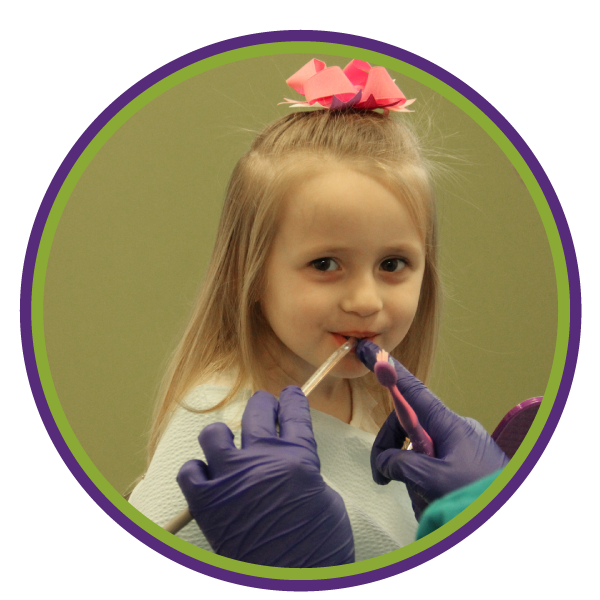 For children who are at a high risk for cavities, we sometimes use a fluoride varnish that sticks to the teeth a bit longer. For some patients, we will recommend supplemental fluorides when appropriate. 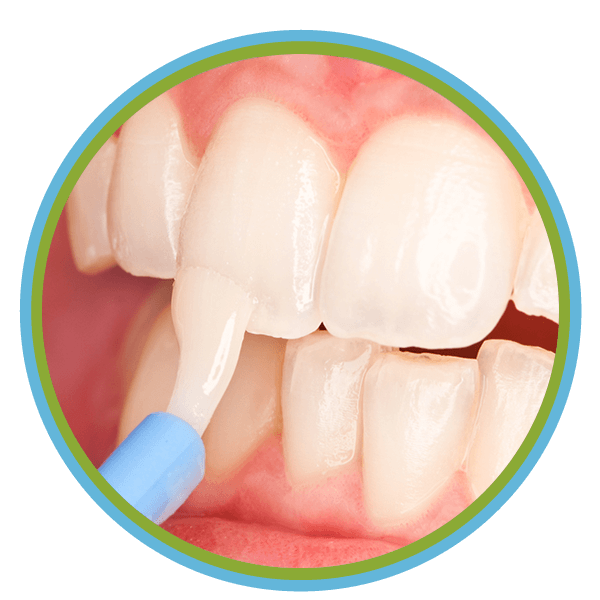 Numerous clinical studies have been done that have reported the safety and efficacy of topical fluoride, but it is very important to remember that fluoride alone will not prevent tooth decay. It is important to brush at least twice a day, floss regularly, eat balanced meals, reduce sugary snacks, and visit your dentist on a regular basis. 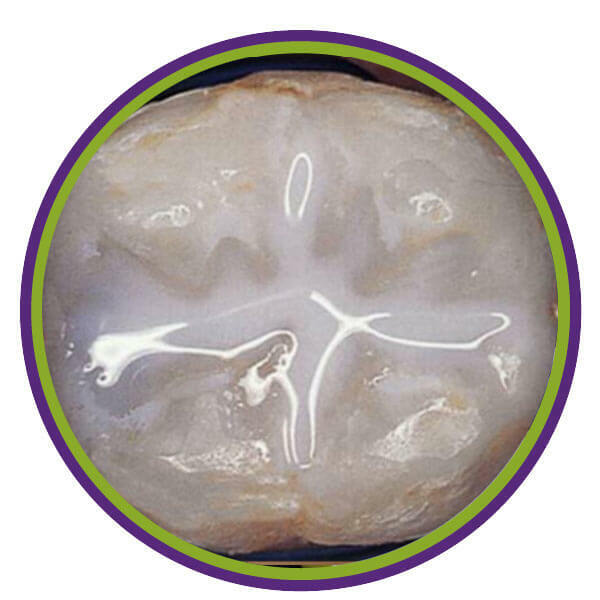 Dental Sealants are mainly used to protect the chewing surfaces of the permanent back teeth (molars). The first of these molars grow when children are about six years old. Another set comes about six years later. 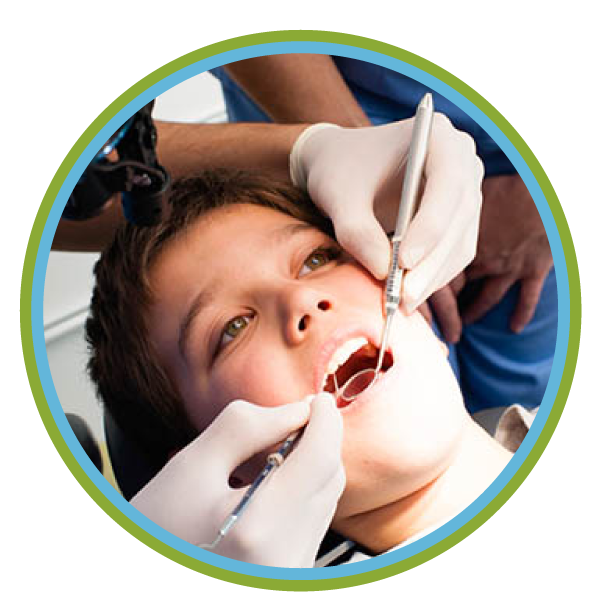 Sealants are used as a preventive measure against tooth decay. They fill in the nooks, crannies and crevices on the chewing surface where cavities can begin. They lower the risk of tooth decay on the chewing surfaces of molars. Dental x-rays, (radiographs) provide us with information we cannot visibly see. Primarily they help diagnose dental decay but also reveal dental problems or anomalies like cysts, bone loss or other dental abnormalities. 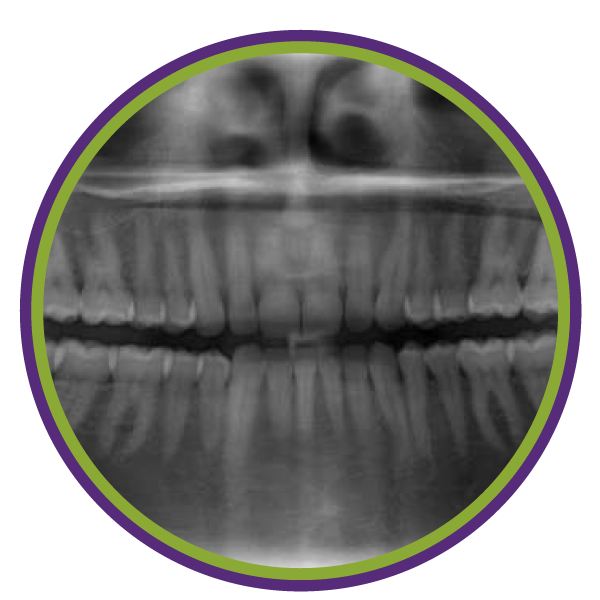 A panographic x-ray (panorex) is taken to provide information regarding the growth, development and position of developing teeth and supporting tissues. Patients often ask if dental x-rays are safe. 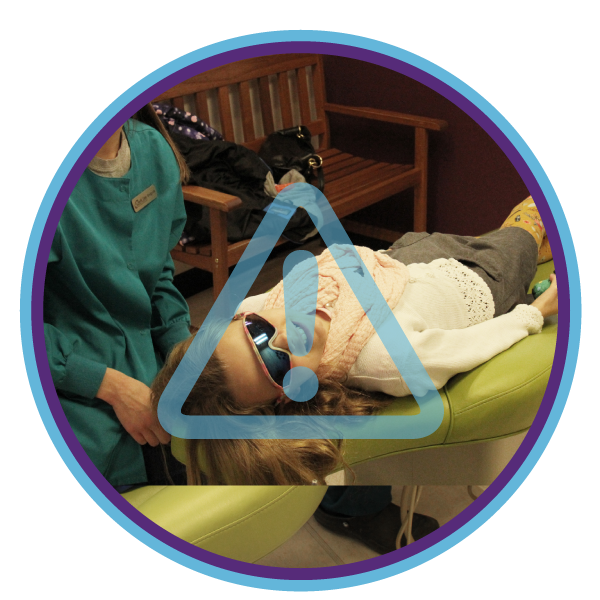 When using precautions as outlined by the American Academy of Pediatric Dentistry and the American Dental Association, x-rays are safe. Furthermore, we use digital x-rays that use even less radiation than traditional x-rays. Dental x-rays are not taken on every visit—we regularly review each patient’s unique situation and request x-rays only when necessary based on medical and dental history, regular screenings, age considerations, and risk for cavities. White fillings, unlike silver fillings, are bonded (glued) onto your teeth. The vast majority of fillings we place in our office are white. White fillings, unlike silver fillings, are bonded (glued) onto your teeth. They are best for small cavity restorations and ideal for stained or irregular front teeth. There are still a limited number of situations where a silver filling may be a better alternative. If this is the case with your child, we will discuss our recommendations in detail with you prior to any treatment. When cavities are very large, they cannot always support a filling. In these cases, we cover the tooth with a stainless steel or white crown. In our opinion, we feel this is one of the best restorations in pediatric dentistry. Baby teeth are at greater risk of decay on all surfaces of the teeth and because they are smaller than permanent teeth fillings can be at a great risk of fracture. By covering the tooth with a cap, it will protect the tooth until it is ready to fall out. If this is the case with your child, we will discuss our recommendations in detail with you prior to any treatment. We routinely extract primary teeth in our office. Extractions are usually needed for infected/abscessed teeth, over-retained baby teeth and for orthodontics. Extraction of primary (baby) teeth do not usually present the risks and challenges that are associated with permanent (adult) teeth. We certainly understand that needing a “tooth pulled” can be an anxious time for both the child AND the parent. Be assured that if this is a procedure necessary for your child, we will review it detail with you. Space maintainers are custom-made, metal appliances cemented (glued) to the teeth. Properly used space maintainers will keep teeth from “shifting” and can help reduce the risk for orthodontic correction later. Primary (baby) teeth usually stay in place until the permanent tooth comes in to replace it. Ideally, baby teeth should be preserved until the adult teeth push them out naturally. Unfortunately, some children lose baby teeth too early. In these situations a space maintainer is placed to save room in the mouth for the adult teeth. Space maintainers are custom-made, metal appliances cemented (glued) to the teeth. Properly used space maintainers will keep teeth from “shifting” and can help reduce the risk for orthodontic correction later. If your child has a dental emergency during our office hours please call and we will see your child promptly. Our office also provides emergency coverage after hours and over the weekend. Accidents happen. If your child has a dental emergency during our office hours please call and we will see your child promptly. Our office also provides emergency coverage after hours and over the weekend. If you have a dental emergency after hours, please call our office at 574-273-8393. Contact information for the dentist on call is on our recorded message. Nitrous Oxide, commonly referred to as laughing gas, is a mild form of sedation we use quite frequently for children who visit our office. Nitrous Oxide is used to help our patients relax during their visit, and to receive dental treatment in a comfortable and safe manner. Nitrous oxide induces a feeling of relaxation. 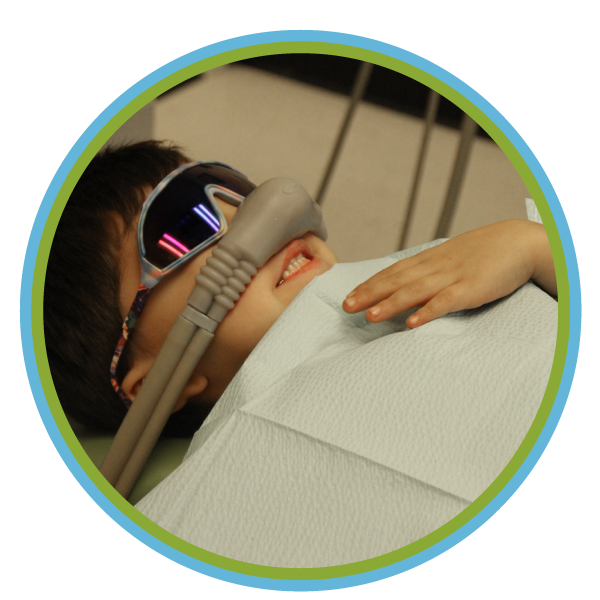 Some kids will become giddy or get a big smile on their face, thus, the term, “laughing gas.” Nitrous Oxide is perhaps the safest sedative in dentistry. It is well tolerated, having a rapid onset, and is reversible, can be adjusted in various concentrations and is non-allergenic. Nitrous oxide is mixed directly with oxygen and breathed in through the nose and as the gas begins to take effect, we use colorful adjectives to describe the relaxed feeling, like “Floating in the chair,” or “Felling squishy like a marshmallow.” Children sometimes state their arms and legs may feel “tingly” as well. The gas has a sweet smell and we often offer a variety of “flavors” (like root beer and watermelon) that help make for a very pleasant experience. The effects of nitrous oxide are very good and well-received by our patients. It raises the pain threshold and may even make the time appear to more pass more quickly. 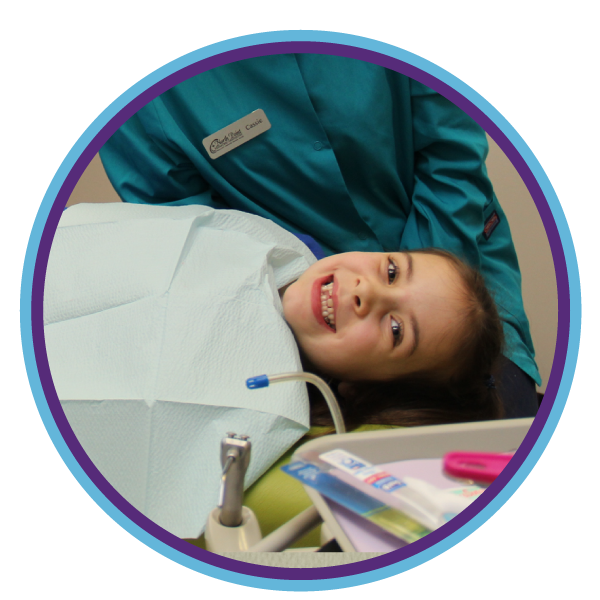 If your child is worried about having dental treatment, most always he or she may respond more positively with the use of nitrous oxide. In addition, it reduces the gag reflex which can interfere with effective dental treatment. When used at appropriate dosages nitrous oxide is very safe to use during treatment and has no lingering side effects. It is eliminated from the body quickly after the gas is turned off. It will not put your child to sleep—he/she will remain awake during the entire procedure. When we are finished, the nitrous oxide gas will be turned off and typically let the patient breath oxygen for a few minutes. In a very small percentage of children Nitrous oxide may not be effective, especially those children who have severe anxiety, nasal congestion or discomfort wearing a nasal mask. We will review your child’s medical history, level of anxiety, and treatment needs and inform you if nitrous oxide is recommended for your child. 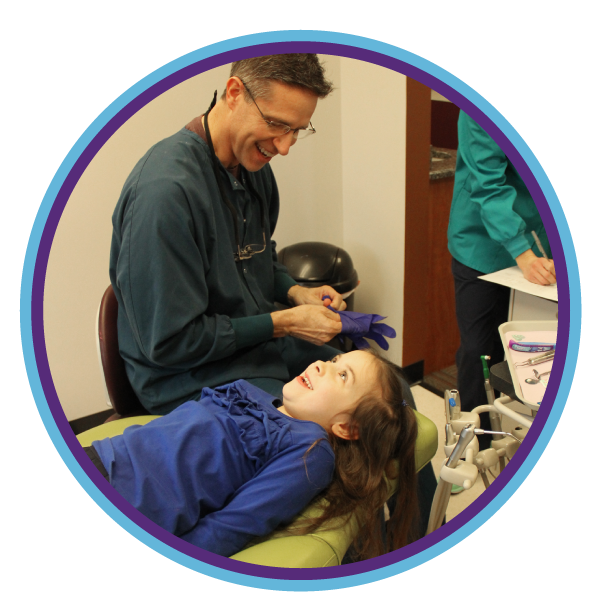 The vast majority of children in our practice can be managed very well by Dr. Fishbaugh, Dr. McCrea, and Dr. Kilgore. They are all very experienced in managing children’s behavior. However, some children present unique treatment challenges that required a different approach. Children with acute anxiety, extensive treatment needs, pre-cooperative behavior, or special health care needs are often candidates for treatment under general anesthesia. We provide this service as an out-patient procedure at both St. Joseph Regional Medical Center and South Bend Memorial Hospital. We are also the only practice in our community that offers general anesthesia here in our office. We are fortunate to have the services of Dr. Zak Messieha. Dr. Messieha has been practicing anesthesia for over twenty years. He has served on the anesthesia residency teaching staff in Chicago. He has published numerous studies on general anesthesia and is a much sought-after lecturer around the world. As his long-standing commitment to highest quality in patient care, Dr. Messieha had the first office-based anesthesia practice in the United States to be accredited by the Accreditation Association for Ambulatory Health Care (AAAHC). His patient-centered approach has been well-received by not only the children we have treated, but their parents as well. It is important to understand that we do not recommend general anesthesia without serious consideration, nor do we make this recommendation routinely in our practice. We do, however, want to provide the best possible care in the safest possible way for our patients. We feel that it is our responsibility to discuss this option when relevant. If this is an option for your child, we will review the risks, benefits and treatment alternatives with you in detail. 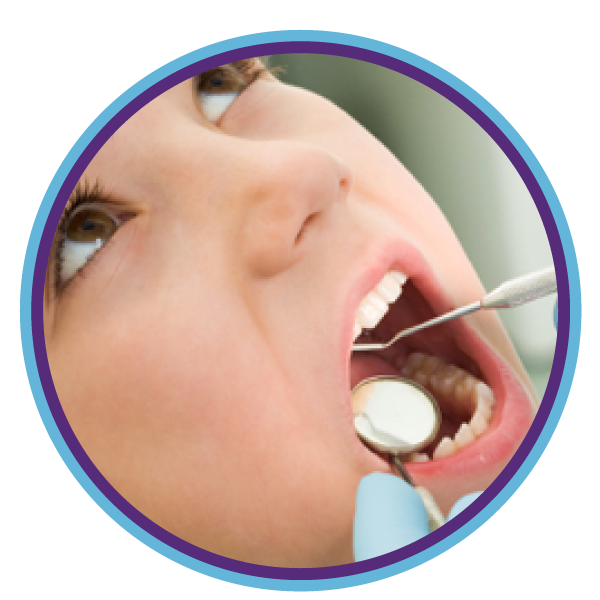 A frenectomy is a common soft-tissue procedure that is performed on infants and children. It refers to the removal of the tight connective tissue (or frenum) from under the lip or under the tongue. Dr. Cara Kilgore provides frenectomy services primarily for infants in order to improve nursing and breastfeeding and occasionally on children to aid in speech development and in coordination with orthodontic treatment. If it is determined a frenectomy is beneficial, the procedure is done using a soft-tissue laser. By using the soft-tissue laser, discomfort is minimized and healing is much faster when compared to using a traditional scalpel or scissor. Simple stretching exercises are required to minimize scar tissue and ensure the best healing possible. We encourage parents and caregivers to consult with us if they have any questions regarding this procedure. If you have specific questions regarding any treatments, products, or services provided and would like additional information, please fill out the form below and we will respond within two business days.